Peter Doran, President & CEO of the Center for European Policy Analysis (CEPA), joins Colonel (Retired) Daniel Roper, host of Thought Leaders, to discuss the U.S. military’s increased focus on long-term strategic competition with the revisionist powers of Russia and China and how this competition is playing out in Central and Eastern Europe. Why are Europe and NATO critical to U.S. national interests? How do the U.S and its NATO Allies deter Russian aggression and confront its exportation of chaos to the West? What inroads has China made by building European infrastructure? Where should the U.S. posture its Army in Europe to enhance deterrence, and should deterrence fail, to fight and win? Thought Leaders, a segment of AUSA’s Army Matters Podcast, brings in-depth conversations with authors of military books and senior leaders. Recommendations for future topics are welcome via email at podcast@ausa.org. Family Voices: Sleep, Food and Exercise - Why Do You Elude Me So? Join Patty Barron, host of Family Voices, as she discusses the real reasons we can’t seem to eat well, exercise, or sleep soundly. This fun and informative conversation with COL Deydre S. Teyhen, DPT, PhD, OCS, Commander, Walter Reed Army Institute of Research (WRAIR), covers everything from where to put the broccoli in your refrigerator to apps that will have you sleeping like a baby. She makes getting healthy fun and DOABLE! Family Voices, a segment of AUSA’s Army Matters Podcast, aims to connect Army families to speakers and issues that are important to their everyday lives. Recommendations for future topics are welcome via email at podcast@ausa.org. Army recruiters SSG Jacob Swanson and SSG Juan Taylor talk about how they encourage Millennials and Gen Z to consider an Army career, with podcast hosts Nzinga Curry, Director, AUSA’s Institute of Land Warfare, and MAJ Brad Cooper, Army Fellow. With so many career opportunities, Army recruiters are helping young people connect with their life goals. Where else can you combine the excitement of combat training, 150+ job choices and education for life after service? The strength of a Nation is in the strength of its Soldiers. 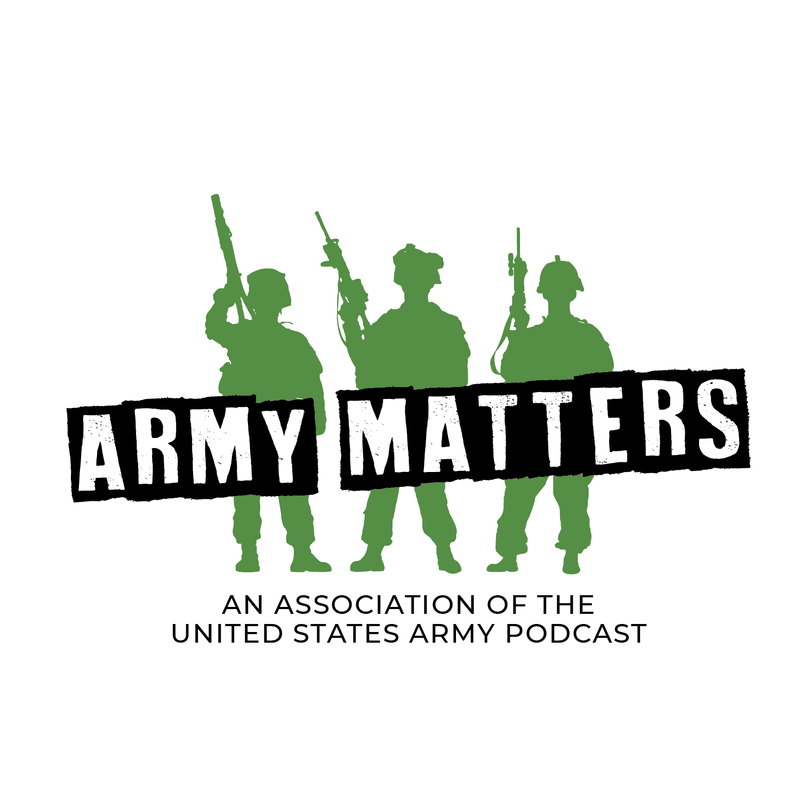 Army Real Talk, a segment of AUSA’s Army Matters Podcast, aims to help AUSA and the Army better connect with the younger generation. Recommendations for future topics are welcome via email at podcast@ausa.org. The Sergeant Major of the Army (SMA) Daniel A. Dailey discusses a new Army credentialing program with host SMA (Retired) Ken Preston, VP, NCO & Soldier Programs, AUSA. How do we get our Soldiers trained and educated for jobs once they are out of the Army? Find out about the new Army COOL program, currently in a Limited User Test (LUT), and how it connects Soldiers with civilian credentials. Soldiers can match credentialing opportunities to their current Military Occupational Specialty (MOS) or pursue credentialing goals outside their MOS – especially important for combat Soldiers. Civilian employers can also use the Army COOL site to learn more about how military training and experience might relate to civilian jobs. Soldier Today, a segment of AUSA’s Army Matters Podcast, focuses on what is important to Soldiers and NCOs. Recommendations for future topics are welcome via email at podcast@ausa.org. Host Joe Craig speaks with author Adam Makos about his new book Spearhead: An American Tank Gunner, His Enemy, and a Collision of Lives in World War II. It is the riveting story of Clarence Smoyer and his crewmates in the Army’s legendary 3rd Armored Division as they journey into the heart of the Third Reich and meet destiny in an iconic armor duel. Adam is a New York Times bestselling author whose mission is to record the stories of America’s veterans. Children born into military families face an assortment of adventures and challenges. Frequent moves, making new friends, repeated separations from the military parent, to name a few. In addition, military families can face the trauma of having a service member parent return home wounded or injured or not at all. Join host Patty Barron and Dr. Stephen Cozza, child psychiatrist and military child expert, as they discuss resilience, resources and research, all focused on the military child and family. In honor of Women’s History Month, our Army Real Talk co-hosts visit with Dr. Francoise B. Bonnell, Director of the U.S. Army Women’s Museum at Ft. Lee, VA. Their discussion demonstrates the impact of Army women on and off the battlefield including the Women’s Army Corps (WAC), the pivotal role of female soldiers in Cultural Engagement Teams in Iraq & Afghanistan, and the heroics of women during battle. The newly renovated museum covers women’s history in the Army from 1775 to present and is a must-see for any Soldier or Army supporter. Army Real Talk, a segment of AUSA’s Army Matters Podcast, aims to help AUSA and the Army better connect with the younger generation. To share show ideas, please e-mail us at podcast@ausa.org. The Sergeant Major of the Army (SMA) Daniel A. Dailey discusses the new Army Combat Fitness Test with host SMA (Retired) Ken Preston, VP, NCO & Soldier Programs, AUSA. Why now for a new fitness test? What are the 6 different events that will be assessed, and how can Soldiers prepare? Soldier Today, a segment of AUSA’s Army Matters Podcast, focuses on what is important to Soldiers and NCOs. To share show ideas, please e-mail us at podcast@ausa.org. Host Joe Craig speaks with authors Brad Meltzer and Josh Mensch about their new book The First Conspiracy: The Plot to Kill George Washington. They discuss espionage and counterintelligence at the start of the Revolutionary War, only months after the birth of the U.S. Army. Brad Meltzer is a #1 New York Times bestselling author and a History Channel television host. Josh Mensch is a bestselling author and documentary television producer. Thought Leaders, a segment of AUSA’s Army Matters Podcast, brings in-depth conversations with authors of military books as well as insights from senior Army leaders. Host Patty Barron provides snippets and commentary on the recent family readiness initiatives forum held at AUSA with Army Senior Leaders. Several new initiatives aimed at improving the quality of life for Army families were unveiled and discussed by the Secretary of the Army, Dr. Mark Esper, the Vice Chief of Staff, General James McConville, and the Sergeant Major of the Army, SMA Daniel Dailey. The Association of the United States Army is a nonprofit educational and professional development association serving America’s Total Army, our Soldiers, Army civilians, and their families; our industry partners, and supporters of a strong national defense. AUSA provides a voice for the Army, supports the Soldier, and honors those who have served in order to advance the security of the nation.